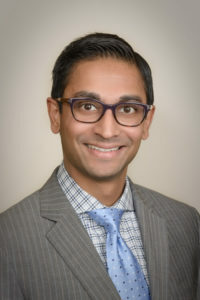 Aatish M. Patel, MD is a lifetime student of health who has followed a dedicated path toward formal training in medicine, specializing in gastroenterology/hepatology. He has authored several articles in medical journals, presented at a CME-accredited conference, co-authored a poster of distinction (top 10%) at Digestive Disease Week, and he remains an active member of multiple professional medical societies. He graduated with a B.A. in biology from Boston University, and next attended St. Matthew’s University School of Medicine. He completed his internship and residency in Internal Medicine at The University of Oklahoma – Tulsa, where he served as chief medical resident during his PGY-3 year. He continued with subspecialty training in gastroenterology at the University of Oklahoma Health Sciences Center, and served as chief gastroenterology fellow during his final (PGY-6) year. Dr. Patel has special interests in therapeutic endoscopy, inflammatory bowel disease, hepatology including management of viral hepatitis, pancreaticobiliary disorders, esophageal and reflux disorders, colon cancer prevention, and ethnic risks related to digestive diseases. Outside of medicine, Dr. Patel is a self-proclaimed “foodie” and he enjoys spending time with his wife and daughter, playing golf, traveling, and all things technological.